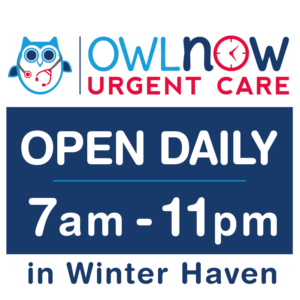 Located in Winter Haven, FL Owl Now Urgent Care provides swift medical care to residents of Winter Haven and the surrounding areas. If your medical condition requires prompt attention, you can count on the expert and passionate physicians at Owl Now. Some conditions such as broken bones and large cuts are non-life-threatening but still require immediate care. Urgent care exists to treat conditions such as this, spanning the gap between an emergency room visit (which is ideal for life-threatening issues) and a walk-in-clinic visit (which is ideal for patients whose conditions are not serious and who can afford to wait). A visit to an urgent care facility is going to be more convenient and affordable than a visit to the emergency room. So long as your injury or illness is not life-threatening, visiting an urgent care facility is likely going to be your best option in terms of convenience, cost, and quality of care. Walk-in-clinics are a good option for patients who do not require immediate medical attention but may need to see a doctor outside normal business hours. Because Owl Now Urgent Care is open daily and on Saturday and Sunday, we can also help with walk-in appointments. If you need immediate treatment that is not serious enough to necessitate an emergency room visit, then Owl Now Urgent Care is your best option. At Owl Now Urgent Care, we are open daily from 7:00 AM to 11:00 PM. We are also open on Saturday and Sunday as well as holidays. So, if you are looking for urgent care on the weekend, we’ve got you covered. We accept most major health insurance and are ready to provide you with the compassionate, effective care that you need. If you or a loved one needs to visit Owl Now, we are located at Winter Haven, FL 550 Pope Avenue NW Suite 200. Awesome Urgent Care center!! I was in and out in 40 minutes. The staff were all very professional. The Doctor was patient and informative. I hope to not need to visit again but should I need to I will. Thank you for a great experience.